He sees them every day. Frames without form, shells without souls, alive but without life. He sees their ghostly and ghastly figures, their blank stares, the emptiness that envelopes them. "They are all 'cool' guys, guys who have lost their drive, their values; guys who have retired from life in their teens. They have no plans for the future, no desire," contends Dr. Griffin Benjamin, the consultant psychiatrist at the Acute Psychiatric Unit of the Princess Margaret Hospital. He can tell from the hollowness of their eyes, the absence of direction in their steps. They're as young as 15 and their future is no longer even a dream, their present lost forever. "More than half have been because of drugs and the most common drug is marijuana," Dr. Benjamin tells The Sun. On the other hand, there's someone who appreciates their position, understands their passion, shares their plight. He's confident that the doctor and the traditional medical fraternity have got it all wrong. "Cannabis is anti-psychotic," argues Henry Shillingford, the lawyer and unabashed, unashamed ganja user and longtime advocate for the legalization of the drug. " Because these people (patients) find that ganja is helpful for their condition they are smoking it, but the doctors say it is because they are smoking they get these conditions." This is just a small sampling of the debate over marijuana use. This debate has been somewhat sporadic here, with some within the Rastafarian community calling for its legalization or decriminalization, while the authorities have simply ignored them. This could change, however, as, on Christmas eve, Uruguay became the first country in the world to legalize, regulate and tax the drug. In the United States, both Colorado and Washington have also legalized ganja use. 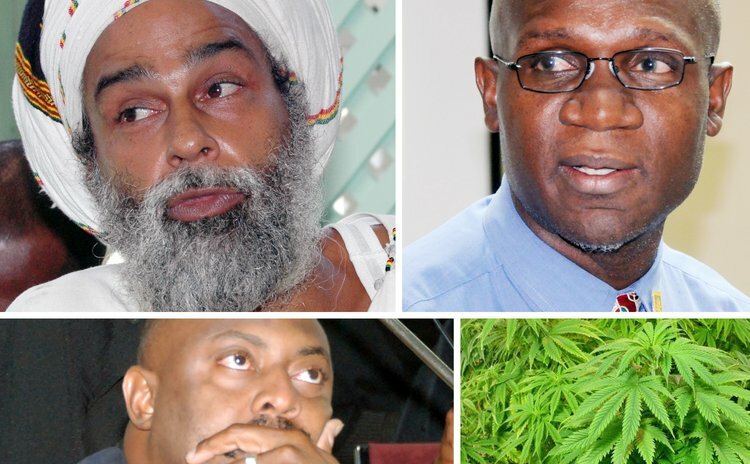 Embolden by these developments, Jamaican advocates of decriminalization planned to launch a cannabis growers' association over the weekend in anticipation of the establishment of a formal ganja industry there. The prime minister of St. Vincent & the Grenadines, Ralph Gonsalves – his country is the top producer of cannabis with over 300 acres under cultivation, according to the US State Department - has sought to take the debate to the highest political level in recent times. Gonsalves wrote to the CARICOM chairman, Kamla Persaud-Bissessar of Trinidad and Tobago last September, asking for a discussion on the medicinal and other uses of marijuana "in a sensible focus not hysterical manner" and pleading for "a reasoned debate" led by CARICOM political and civic leadership in the context of the legislation of the drug. It's a position supported by the minister of legal affairs, here, Ian Douglas. "If the move in Colorado is where it's going, the Caribbean has to look at it again," Douglas, who is also the tourism minister, tells The Sun. "We have to approach it as a general debate, we really have to approach it as a region. Do we want to decriminalize the use of up to a certain amount?" This is right down Henry Shillingford's street, although he believes that Dominica should lead the debate and should be the first among Caribbean nation to legalize cannabis. The time is right not only because of what is happening internationally, he tells The Sun, but also because of the current difficult financial situation and the fact that the island is an agriculture-based economy and sells itself as an eco-tourism and health and wellness destination. "Dominica is preeminently disposed to selling marijuana on this basis," the outspoken lawyer says, speculating that tourism and agriculture will see immediate positive results with a flood of visitors from north America coming here to smoke the weed for medicinal reasons. "It's an opportunity for Dominica to shift its economy, to move to a 21st century product. By legalizing cannabis you are really making a statement for nature, by doing that you are enhancing your 'Nature Island of the World' brand," adds Shillingford, who supports control on its use and sale, as well as a ban on exports. In addition , the cost of prosecuting people for small amounts is prohibitive, he argues. This, says the legal affairs minister, Ian Douglas, ought to be part of the debate. "We have juveniles being incarcerated for small amounts of marijuana use so we have to ask ourselves is it worth the cost?" Meanwhile, Dr. Benjamin's position on the effect of the drug is supported by the US National Institute of Drug Abuse ( NIDA) which supports most of the world's research on the health aspects of drug abuse and addiction. According to NIDA, evidence suggests a link between cannabis use and psychosis and that the drug impairs short-term memory, judgment, and other cognitive functions , and increases the risk of schizophrenia, anxiety, depression, and a-motivational syndrome. Admitting that "the people who say marijuana is safe and good are winning the argument in public", Dr. Griffin says he's seen too many lost souls to endorse its legalization. "From a clinical standpoint, it is a dangerous thing to use marijuana. From a clinical standpoint I would not advocate marijuana use."